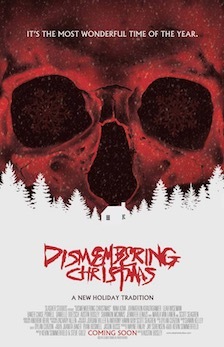 My blog post review of the upcoming 2015 Christmas slasher horror movie from Slasher Studios, Dismembering Christmas. Dismembering Christmas is upcoming 2015 kickstarted (crowd funded) holiday horror movie of the slasher sub-genre, by Slasher Studios. It is their second feature film following behind their 2013 80s style slasher Don’t Go to the Reunion (which won awards including Best Actress at Crimson Screen Horror Film Festival). DC is set to be released in October 2015. Many horror fans or at least Friday the 13th fans (such as myself) have wanted for years to see a Friday the 13th set with Jason Voorhees in the snow. I don’t quite know why, but we have and those good folks over at Slasher Studios were no exception. I previously interviewed Kevin Sommerfield (who has a small cameo at beginning of DC) from SS about Dismembering Christmas in episode eight of my podcast, Love Horror? Podcast. Dismembering Christmas had (according to IMDb) a modest estimated budget of $25, 000 USD, as opposed to Don’t Go’s $18, 000. I am fortunate to have seen both of Slasher Studios’ feature films. I previously rented Don’t Go and was lucky enough to be given the opportunity to watch a pre-release screener of DC and I must start off my saying that if you haven’t seen either of these films and are interested in checking them out, please start off by watching Don’t Go first. Don’t Go is by far the superior movie despite being SS’s first feature length film. DC is certainly a much more ambitious project but is plagued by bad cuts and bad sound quality. I should note that the problem with bad sound quality is NOT throughout, only occasionally. One such occasion is a scene near the beginning when a couple are driving to the cabin, the guy is clear, but the woman’s audio is atrocious. Also, this actress’s acting for the first half of the movie is very stilted, although not so much in the second half (Shannon Mcinnes as Lauren). There is a group of friends (eight), which is common in slashers and this wouldn't normally be a problem, however it is not apparent who the final girl (leading lady) is until the other female characters are dead. The final girl is Sam played by newcomer Nina Kova, who made for a good scream queen and some have compared her to Neve Campbell in the Scream franchise. However, she reminded me more of Amy Steel in Friday the 13th Part 2 (not sure why). One scene in the movie is completely unforgivable. In a scene towards the end (trying not to give spoilers) the final girl has blood splattered on her face and you can quite clearly see from the left side of the screen a black tube that is squirting the red liquid. This is so bad I want to defend the filmmakers by saying this must have been deliberate, maybe a joke about bad effects in old horror movies. But as this is not the tone of the rest of the movie I have to say that this is probably a mistake, one that I am shocked was not noticed and fixed in at least post-production. It unfortunately also has a predictable ending and a meagre runtime of an hour and seven minutes (excluding credits). So, even though I do like Slasher Studios and their first film did not leave me disappointed (in fact quite the opposite) this one did and I am unfortunately unable to recommend Dismembering Christmas for anything more than a quick rental. But please don’t let that make you think these are bad film-makers, they are not and I do recommend you watch Don’t Go to the Reunion, a very professional and well put together movie. I will write a post on Don’t Go at a later date.